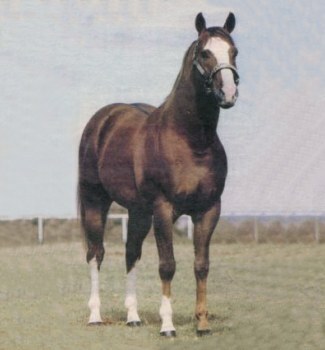 Foaled in 1973, the 15.2 hand sorrel stallion was named for the year he would be eligible to run in the All-American Futurity. And run he did. In 1975 he lived up to his name, winning the All-American and with it the richest purse quarter horse racing had witnessed up to that time. That same year he was named Quarter Horse Running 2-year-old Colt and Stallion, and was the 1975 High Money-Earning Horse. Those closest to him have contributed clues to his success. His jocky likened his start to a drag race. He said that the horse took such a deep bite of the ground, that with all his power, it was like 'spinning your wheels' at the start. He was said to come out of the gate so strong that you had to be careful not to lose control. Top a good start like that with blinding speed and you have one hard to catch horse. His wins were at distances of 330 yards up to 440 yards. He had the start and the quick speed, and also the stamina to see it through. Bugs Alive died following colic surgery on December 15, 1985 at the age of 12. He was owned by Ralph and Betty Shebester of Wynnewood, Oklahoma. Tommy Wells of Harrah, Oklahoma, stood him. In an interview with Barrel Horse News, Wells was asked about the traits the stallion passed on to his progeny. "Stamina and willpower," he said. "They're not quitters. Bugs wasn't a quitter. Pain's no problem, they just keep going." Bugs Alive In 75 - barrel horse bloodlines at their best!